Are you having a morning meeting at your school, office or church? Are you responsible for making sure everyone not only has something to eat, but they actually enjoy it? Is everyone tired of cold, dense bagels and soggy tacos? Are you tired of the hassle of serving a hot breakfast with plates, knives, forks, and chafing dishes – as well as the struggle of cleanup afterward? Give your guests what they want — a warm, savory option that is easy for self-serving and requires no help or chafing dishes. Place your order and have delicious Shipley kolaches delivered to your meeting place. Shipley Do-Nuts will cater and deliver for your meeting or event anywhere throughout the Houston-Metro Area. Shipley Do-Nuts Catering offers you a much wider selection of varieties, packaging, and sizes of kolaches than you will find in any of our storefront locations. All of the above varieties are also available in a kid’s/snack-size which are ½ the size of the regular kolache, as well as Kolache Poppers™ which are ¼ the size. Our large size kolaches have 40% more meat than our regular size. 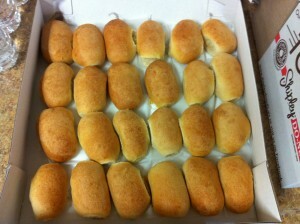 If you order online or call, we’ll cater and deliver hot fresh baked kolaches right to your meeting or event. 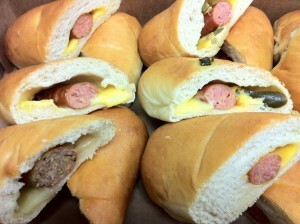 Not only will you have your kolaches delivered, you can also include your favorite donuts, hot & cold drinks, and more. Take a look at the menu, and then order online today. It’s deliciously simple! For a small additional fee, you can have your kolaches individually wrapped & labeled. Having your kolaches individually wrapped ensures a higher level of hygiene for your guests. With each variety being clearly labeled, guests can quickly identify their choice which speeds up the serving process.